When you score Project Beale, place 1 agenda counter on it for every 2 advancement tokens on it over 3. 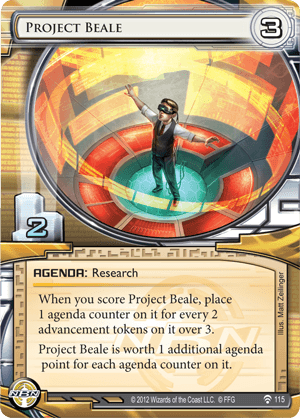 Project Beale is worth 1 additional agenda point for each agenda counter on it. A little math for those of us who sometimes forget how many counters = how many points on Beale. I know in the heat of the game, I have forgotten. The formula at the bottom is a friendly and helpful reminder. (# of Advancement Counters/2), then round up. Just a note for any newer players, SanSan City Grid doesn't reduce the number of advancement tokens needed on Beale to have it be worth extra points. If you install a Beale in a remote with a rezzed SanSan then you can score it on 2 advancement tokens to have it be worth 2 agenda points but you'll still need to 5 advancement tokens to make it worth 3 agenda points, 7 tokens for 4 agenda points and so on. The most common use of Project Beale seems to just be to use it off of the Astro-train (AstroScript Pilot Program to score it for a win because once you've the Astro-train going you're scoring out of hand even without a SanSan. I've rarely seen it advanced for anything other than it's base agenda value with the exception of some Trick of Light or with Shipment from SanSan magic. This is one of the strongest 3 / 2 agendas available and enables the never advance game in NBN. It enables additional shenanigans and is the only agenda that you can use to score and win the game, you need a lot of advancements (13 in total) and usually a tagged runner and Psychographics but it's possible. Hard-Hitting News might already activate it. It encourages you to use scoring windows especially in the early game, you can score 3 points to reduce the number of agendas you need to score to 2 or in the late game you can use it to close the game. It also forces the runner to run even when they are not ready. This agenda is called Global Food Initiative 4 - 6 in any NBN deck and this is true! You can install, advance, advance it and score it as a 5 / 3 agenda, while it's only worth 2 points to the runner. Truth is as well, this only counts 2 points to your 20 agenda points, so it's not a GFI in this regards, but on the other side you can also score it as a 3 / 2 and that makes it one of the most flexible agendas in any NBN deck.